The H. Lee White Maritime Museum is swabbin the decks in preparation for a hearty morning of pirate carousing. Brush off your eye-patch, grap your parrot and and prepare for two hours of fun. 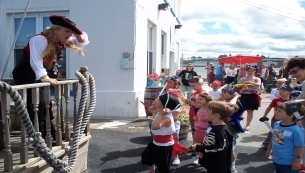 The fun starts at the Museum, located in Oswego's Historic Maritime District, and allows for fellow pirates, land lubbers and the lot to mingle and become pirates for a day. Pirate outfits are strongly encouraged. This fun, educational event features games, music, pirate grub, tours of the historic vessels, a scavenger hunt and treasure to take home. This event will occur on both July 16th and 22nd, 2015. Recommended ages range from 2-10. Tickets are $15 for childrend and $4 for adults, pre-registration/pre-payment required. For more information, contact a museum representative at 315-342-0480.